﻿ Recycling is so yesterday! Don't buy packaging in the first place. 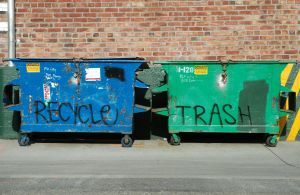 Yesterday, a neighbor and I got into a discussion about recycling. Recycling keeps items out of the landfill and puts glass, plastics, and cardboard back into production. But is it a good thing? The plastic you toss into the recycling pail has to be processed before it can be reused. It has to be sorted (energy) washed (using clean water) and sterilized (more energy), then chopped up (more energy), transported (yet more energy) and finally used as the raw material to make yet another molded, printed, wrapped, package to hold our food. That is better than throwing it in the garbage, I guess, but it certainly doesn't sound "green" to me. Why are we worried about recycling, when we should be worried about the over production of unnecessary packaging? Hungry Planet: What the World Eats by photographer Peter Menzel and author-journalist Faith D'Alusi, is a photographic record of what diverse populations eat in a typical week. It is a wonderfully informative book and I strongly recommend everyone read it, as it will put your own family's food consumption into perspective. As I thumbed through the pages I noticed the average family from a "civilized" society has a very high food bill because they eat a lot prepackaged foods and a significant amount junk food, while impoverished third world families sit behind sacks of grain and a wide array of fresh vegetables and fruit. While not diminshing the problem of those who are truly hungry from lack of food, it appears we now view a wealth of fresh ingredients as poverty, while the privileged eat a diet of fillers and thickeners, artificial dyes, sweeteners, flavors, preservatives and all manner of unpronouncable chemicals, triple wrapped in brightly colored packages in just the right size to feed 2 or 4. No matter where your ancestors lived, you can be sure they didn't go to the supermarket and leave with a cart full of prepared foods. There were no supermarkets. 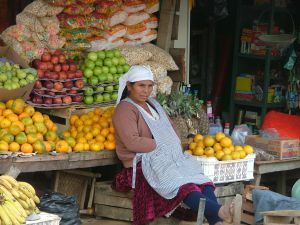 They had a small garden, maybe a few fruit trees and berry bushes in their back yard, and for the rest of their diet they brought a sack or cart to open air markets and filled it with fresh produce, meat, dairy and bakery items. They didn't think about "going green" because when it came to food, they were already there. Think of all the money we spend on PACKAGING. Not food. Food is cheap. We spend our money on pretty printed cardboard, plastic bottles, and big gaudy plastic bags, that we THROW OUT. We don't even keep the stuff. It's just a tiny container that attracts our attention at the store, tells us we are feeding our family healthy nutritious foods when we are not, and then when we take out the tiny portion inside, we get to toss that pretty package in the garbage can. Why do we put so much emphasis on recycling, when you can buy in bulk as much as possible and make your own products at home? 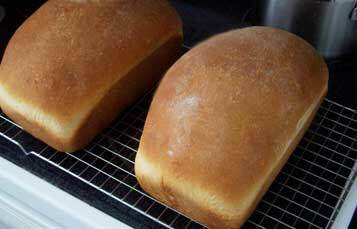 Making your own bread is simple. Throw 5 ingredients in a bread maker and come back 90 minutes later. 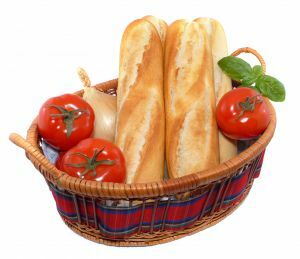 You just saved $2 over supermarket bread, and you have a hot, fresh and more nutritious loaf without any packaging to toss into the trash. 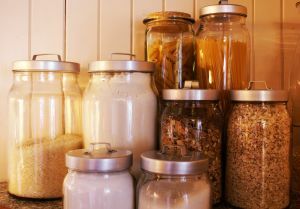 Go through your pantry and learn how to make the products you normally buy in itsy bitsy pretty little jars. Make a pot of soup or a casserole and freeze for later what you don't eat tonight. Make your own cereal. What is more healthy for you than granola? It is just oats and honey, slowly roasted in your oven. That is less effort than making home made cookies - and if you make your own granola you can customize it and add the flavorings and dried fruit or nuts you like, not something prepackaged for the masses at the store. Making your own jams and jellies, condiments and spice mixes is also simple. You don't have to do it all today. Every month learn how to make one thing from scratch. Just one thing. If you don't have the equipment to can or freeze or dehydrate, start with items that don't need anything special - like tossing together your own spice mixes and mixes for cakes and pancakes and bisquits. 10 minutes effort on the weekend will pay off in big savings. You won't find big bags of bulk items in the supermarket, of course. The supermarket makes its profit off of pretty packages that we have to then recycle to feel like we're doing something good for the planet. You'll need to shop at farmer's markets, ethnic markets, and wholesale restaurant supply stores to buy in bulk. But the prices will suprise you, and make you realize you're not just paying for the contents of those pretty packages, but the package itself. Recycle? Sure... it is better than the trash. But how about we don't spend our hard earned money on excess packaging in the first place, and just buy FOOD? "You're weird." my neighbor said. Yes, I guess I am. I don't buy everything in bulk, of course. My family and I enjoy a bag of potato chips as much as anyone. But I do try to buy in bulk whenever possible. It just makes sense. I want to spend my money on food, not packaging or processing. So I want the highest quality, least processed, products that I can find, and often the more the manufacturer or farmer can fit into a bag or box, the cheaper the cost. Because I buy whole, unprocessed foods, I have the extra bonus of filling my pantry with foodstuffs that have an extremely long shelf life. 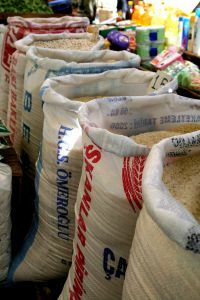 I have many varieties of grains, such as wheat, barley, corn, spelt, and oats. I have jasmine rice, brown rice, basmati, black, red, and wild rice. Dozens of legumes - cranberry beans, pinto, navy, lentils, and yellow and green peas. Sugars, molasses, maple syrup and honey. 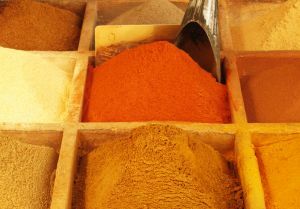 I buy my spices at ethnic food stores where I can get a pound for little more than the price of a small jar at the supermarket, the spice is pungent and fresh, and does not have silicone or cornstarch fillers. It is just pure spice. I keep my bulk ingredient supply in food safe pails, in a cool dark location, and refill quart containers that I keep handy in my pantry. 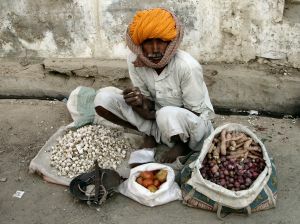 I still go shopping at local markets to buy fresh ingredients - dairy, meat, fish and produce. But again, I buy locally produced products that do not have to be flash frozen, treated, or preserved because they will be transported long distances. Keep cutting out that middle man. The goal is, from the farm to your plate with as few steps in between as possible. Every afternoon I take a bit of this and a bit of that, combine it, and I have a healthy dinner for my family. We eat the same menu as everyone else - we have tacos and pizza and Gen Tso's chicken, big salads and roasts and stir fries, kabobs with couscous, spaghetti and meatballs, soft bread with peanut butter and jelly, and hearty soups and stews and delicious casseroles. I don't spend all day in the kitchen or bent over a stove. Quite the opposite. I spend time processing my ingredients precisely so I can slap together meals post haste. But by avoiding processed foods and shopping in wholesale markets and bulk suppliers, there are few packages to recycle and no preservatives or artificial sweeteners going into the bellies of those I love. Best of all, I save tons of money. Better in my pocket, better for my family, better for the planet. I'm in Love with Vegetable Powders.